For a long time most football fans experienced the game via the radio, making broadcasters cult figures. Like Allou Ndiaye in 1950s Senegal. In the early 1950s, a Senegalese radio announcer known as Allou developed a style of match reporting on the radio that delved deep into West African storytelling traditions. He drew on the styles of the griot—hereditary musicians who for generations have spoken the history of families and communities—to recount the exploits of these new heroes in real time. In one memorably tragic match, he recounted live as the player Iba Mar Diop scored a penalty kick at the last minute, winning the game for his team—only to collapse from a heart attack and die moments afterward. 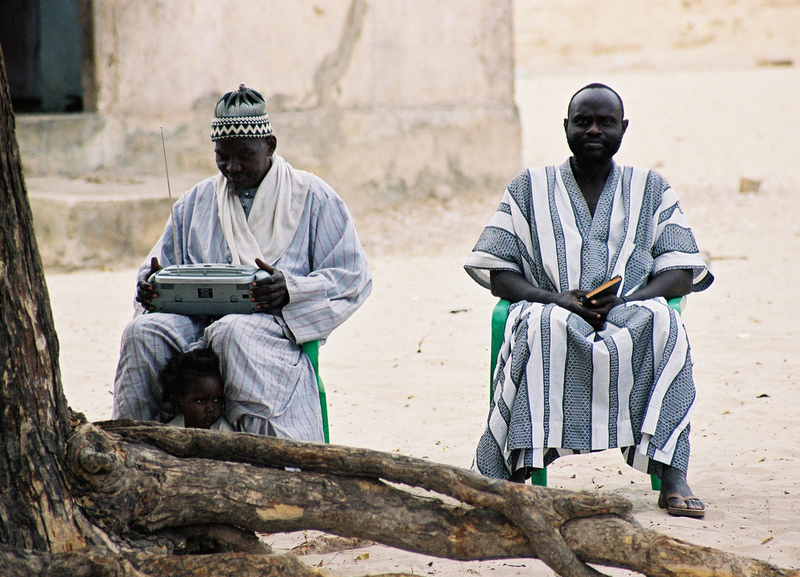 Radio journalists such as Allou gave audiences a way to experience and understand such dramatic moments by connecting them to broader cultural narratives about heroism and sacrifice. Allou’s full name was Alassane Ndiaye. He was part of a distinguished Senegalese family. His uncle was Blaise Diagne, who had represented Senegal in the French National Assembly for decades, and was the father of the soccer star and later Senegalese national team coach Raoul Diagne. Another of his relatives, Lamine Guèye, was mayor of Dakar and later the first president of the Senegalese National Assembly. Ndiaye grew up on Gorée, an island near Dakar. He attended university in Dakar and became a distinguished history teacher, and hosted a radio show about Senegalese history. Ndiaye had loved playing soccer as a child, and that is when he was given the nickname Allou, a shortened version of his first name, by his teammates. Allou began his career as a sports commentator by accident. One day at the Parc Municipal des Sports in Dakar, he suddenly found the microphone thrust in front of him. It was just after World War II, and football was booming in Senegal. But there was only one journalist calling the games on the radio, a man named Pierre Véran. Perhaps he was tired, or perhaps he wanted to play a trick on Ndiaye. “I’m handing the microphone to my young colleague Allou,” Véran declared suddenly. As he later remembered, Allou had hesitated for a minute or two, “as if drowning in an endless sea,” and Véran looked at him expectantly. Somehow, though, Allou found his voice and began to narrate the match. Unexpectedly, he had found a new calling. home, people gathered around the radio, “ready to let themselves be seduced” by his electrifying voice. Allou had to help listeners visualize what was happening and, like other radio announcers, developed a rich and evocative language that brought together detailed description of plays and moves with a larger, poetic celebration of the meaning of the game. Fans were “transported into another world” as Allou turned the narration of games into an opportunity to reflect on almost all aspects of human life. He infused his accounts of matches with rich historical, cultural, and philosophical references. There was, Ly notes, no “lyric theme” that he hadn’t at some point talked about in relation to soccer: “Love, death, human destiny, nature’s charms and mysteries, the world and its abysses, grandeur, the beauty and nobility of sport, the power of God and his ineluctable decisions.” Delving deep into Senegalese tradition, Allou created a universe of sound and reflection around each match. Though Allou was well versed in tactical questions, Ly argues that a game of soccer for him was always much more than “an abstract and narrow game of chess, a problem of applied tactics.” It was an opportunity to create a work of verbal performance, a spectacle of vocal sound. He had an “ample and easy eloquence,” and “an incomparable verbal richness and sumptuousness.” He offered up a “spontaneous profusion of images,” and used the rhythm of his voice to communicate the drama and emotion of the match to those who could not see it. “His voice, slow and suave when the game was calmly being played in the midfield,” was “amplified and fired up when the action got closer to the penalty area or when danger became imminent,” so that those who listened on their radios felt all the emotions that “constricted the hearts” of those in the stadium. Allou’s live accounts of the games were “prose poems,” a “poetry at once lyric and epic.” In this, he was also teaching fans how to connect soccer to other aspects of their culture. His commentary gave fans new ways of thinking, and feeling, through a game. Excerpted from “The Language of the Game: How to Understand Soccer.” Copyright © 2018 by Laurent Dubois. Available from Basic Books, an imprint of Perseus Books, a division of PBG Publishing, LLC, a subsidiary of Hachette Book Group, Inc.